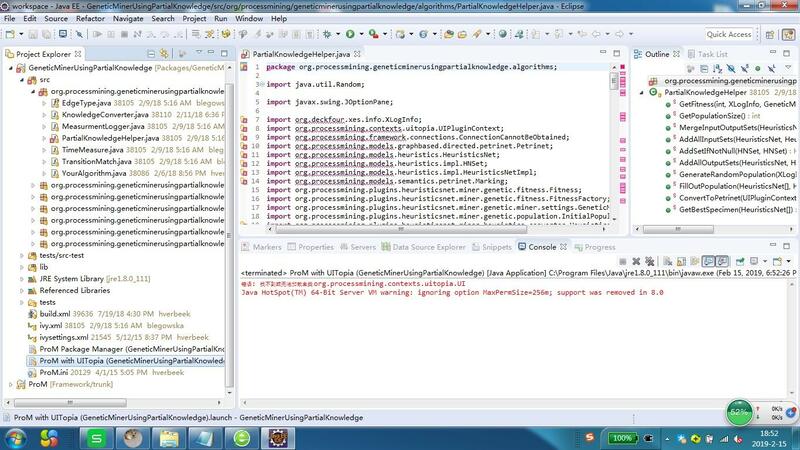 Right now I am trying to compile GeneticMinerUsingPartialKnowledge, and then test some new ideas. However, I meet some problems when I compile the project. I have checked the libraries, including ProM-Models.jar, HeuristicsMiner.jar ... But I can not find these files. How can I solve this problem. question 2: I have two projects, i.e. Framework of ProM and GeneticMinerUsingPartialKnowledge. Which is the correct way to combine them, add the Framework to the GeneticMinerUsingPartialKnowledge project, or the opposite? Or any other method? Do you have the IvyDE add-on installed in Eclipse? You need this add-on to resolve the inter-package dependencies. When installed, Ivy will take care that the dependencies (see the ivy.xml file for this) are resolved and available in your GeneticMinerUsingPartialKnowledge package. There is no need to combine them. The GeneticMinerUsingPartialKnowledge contains dependencies on the ProM framework. Ivy will resolve these references and make sure the framework is available in the GeneticMinerUsingPartialKnowledge package. You can run ProM from the GeneticMinerUsingPartialKnowledge package using the "ProM with UITopia (GeneticMinerUsingPartialKnowledge).launch" file. Any changes in the GeneticMinerUsingPartialKnowledge package will be tkaen into accoutn when runnign ProM this way. Many thank you for your reply. I installed ivyDE, but there exists another problem. When I run ProM with UITopia (GeneticMinerUsingPartialKnowledge).launch, the console outputs "Error: The main class org.processmining.contexts.uitopia.UI could not be found or loaded ". How can I solve this problen? What is missing in your overview in the Project Explorer is the Ivy folder that is supposed to be there. This folder contains all libraries resolved by Ivy. Please right-click the "ivy.xml" file and select "Add Ivy Library..." from the menu. Leave the default settings as they are, and select "Finish". This should create the Ivy folder and start Ivy to resolve dependencies. The problem with running ProM is related, as the main class it is looking for is contained in one of the libraries which need to be resolved by Ivy. 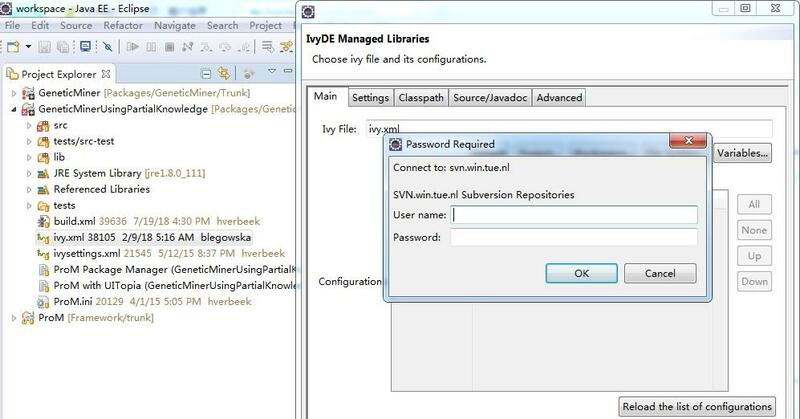 When I choose add ivy library, it requires username and password of svn. Is this normal? How can I solve it?